The sample project is included as "training grounds" to help you become more familiar with Smartvid.io. Access your sample project at any time from the Projects landing page. If you've never used your sample project or haven't in a long time, reset it from your settings page to make sure you have the latest SmartTags & features. Safety analytics - Find potential safety risks in your photos to reduce your company's exposure and incidents. Progress tracking & safety videos - Streamline tracking field progress and key milestone documentation. Create project-specific videos to document site hazards for use in tool box talks, project safety meetings, and company best practice training. Approve marketing materials - manually tag photos and videos as Approved or Not approved for external marketing materials. Use shared links to streamline approvals and create links to easily give other teams access. Safety image tags act as an “extra set of eyes” that monitor project photos and automatically tag workers missing personal protective equipment (PPE) and other common areas of risk, including ladders and rebar. Once files are tagged, you can take action by sharing them with other project members. Type the email address you want to share with (matches to other project members will be auto-suggested) in the sharing pop-up. Try searching for the No Hi-Vis, Ladder, or Housekeeping tags. 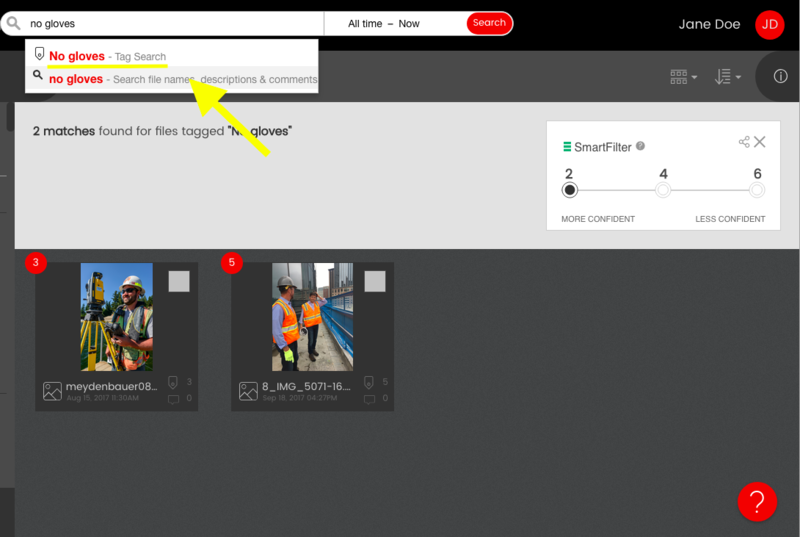 Upload your own files to the sample project, or set up an integration, then search for No Gloves, No Hi-Vis or No Hard Hat and see what you find! Audio tags make it possible to take narrated videos to easily track project progress and milestones. In order for the Smartvid.io engine to recognize spoken word, you must first add tags to your tag dictionary. By adding tags to your dictionary, you tell our software engine to listen for those tags. While audio tags work for essentially any English words, check out the Progress and Milestones category in the sample project's tag dictionary to see some common examples. Like progress videos, safety personnel can also use audio tags to improve safety practices on job sites. 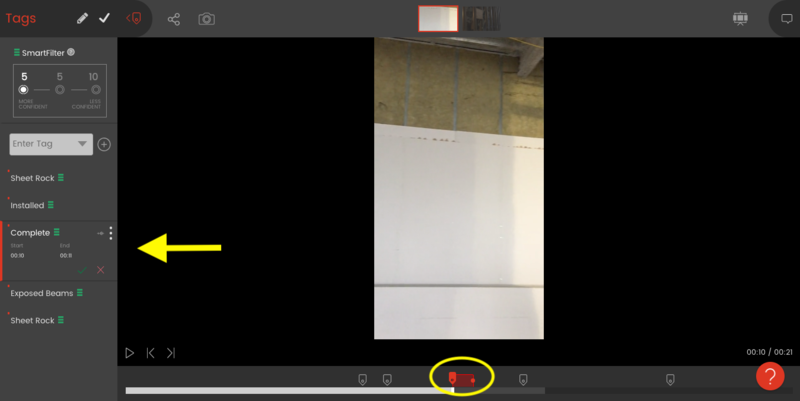 Using the Smartvid.io mobile app, site safety managers can take walkthrough videos where they observe examples of best practices and risk areas. The Smartvid audio tagging engine will then analyze the video and assign tags where it "hears" them. Full videos or snippets can then be shared, downloaded, and used later as a library of real-life training examples. Search the sample project for Guard Rails to see an example video from a safety walk. Next: Try using some default tags in the Progress & Milestones or Observations categories in narrated videos. (Take them with the our mobile app so they'll be automatically be synced to Smartvid.io -- no need to upload manually!) Next, add and use your own tags. You can also check out some tips for using audio tags here. 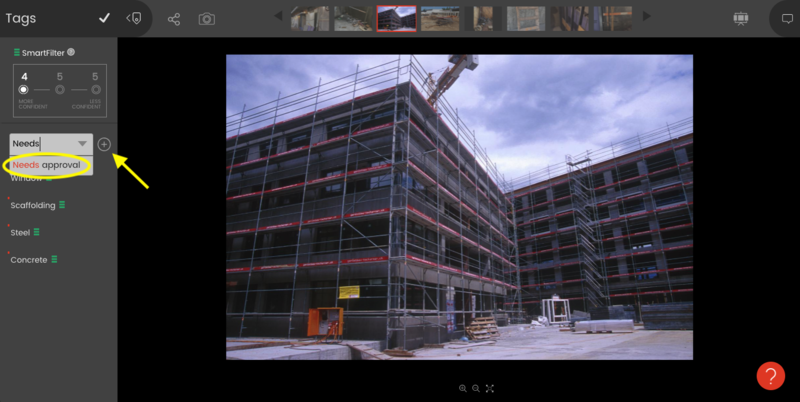 Photos and videos are crucial for bids, proposals and most other construction marketing. Unfortunately, marketing teams often have limited access to project photos, and requests for access or use approval often get buried or lost in long, inefficient email chains. Read on to see how teams use manual tags to solve the problem and streamline their marketing process. Next, search the project for 'Needs approval' to pull this and any other pending files and create a shared search link to send to your safety manager. Shared searches are dynamic, meaning they update automatically whenever new files are added to the project with the searched tag. Once your safety manager reviews files and tags them, regularly search the project for Approved for marketing tag to see and download files ready for use.